As unnecessary prequels go, "Solo: A Star Wars Story" isn't bad. It's not great, either, though—and despite spirited performances, knockabout humor, and a few surprising or rousing bits, there's something a bit too programmed about the whole thing. It has certain marks to hit, and it makes absolutely sure you know that it's hitting them. Everything that you expect to see visualized in "Solo," based on your experience with previously stated "Star Wars" mythology, gets served up on a silver platter, from young Han Solo's first meeting with Chewbacca to Han winning the Millennium Falcon in a card game from its original owner, Lando Calrissian, and making the Kessel Run in less than 12 parsecs (that parsecs are a unit of distance, not time, is properly explained at last), to the fact that Wookiees hate to lose at three-dimensional chess and are strong enough to rip people's arms from their sockets. We also get to see what some of our favorites were like when they were younger (Donald Glover's Lando walks off with the movie). It's fan service of a high order. Whether you consider that a bonus or plus will depend on what you want from a "Star Wars" movie. In some ways, this movie is the antidote to the sort of "Star Wars" movie that viewers who despised the prankishly irreverent and oddly introspective "The Last Jedi" seem to have wanted: one where the payoffs to setups are italicized so that nobody can miss them, artistic license is subordinated to brand management, and every reference, no matter how small, that was so lovingly memorized by devotees of the franchise is placed under a spotlight for the audience's recognition and self-congratulation. It's checklist mythology, but thankfully served up with enough panache to make the trip engaging. There are also quite a few scenes that fill out the "Star Wars" universe in ways that only tangentially have to do with Han Solo, Chewbacca, and other established characters (I'd rather not say which ones, because a couple of them are genuinely delightful). 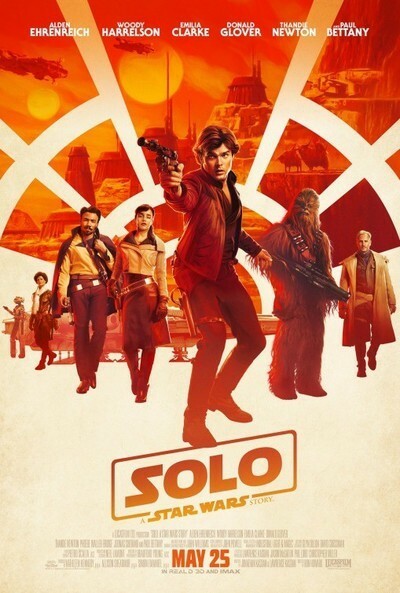 These tend to be the most engrossing sections of "Solo" because they treat your eye to vistas that you probably haven't encountered before, unless you're familiar with the older cultural sources that the filmmakers are raiding for inspiration—and even then, director Ron Howard (replacing Phil Lord and Christopher Miller) freshens them up and makes them feel lived-in. We meet young Han (Alden Ehrenreich) and his girlfriend and partner-in-crime Qi'ra (Emilia Clarke) on a mining planet that's completely covered by industrial structures and runs on forced labor, some of it involving children; the charcoal-smudged visuals, narrow streets and alleys, and hardbitten street urchins with English accents add up to high-tech Charles Dickens. When Han signs up for the Imperial Navy but ends up serving in the infantry in a pointless campaign where he meets his future smuggling partners Val (Thandie Newton) and Tobias (Woody Harrelson), the images of suicidal cavalry charges and muddy trenches are straight out of a World War I picture like "All Quiet on the Western Front" or "Paths of Glory." A heist of a fuel train—more like a mountain monorail that seems to slither around the peaks like a metal snake—evokes an old Western where cowboys jump from horses onto the sides of locomotives. And so on. The character of Han Solo was introduced back in 1977 (pre-George Lucas digital revisions) gouging an old man and a farm boy for as much money as he could get, then pre-emptively murdering a a bounty hunter in plain view of bar patrons. Nothing in this film is as daring as those choices—as played by Harrison Ford, Solo was a borderline antihero and the only major character in the original trilogy who had a dangerous edge, albeit one that Lucas and company immediately began sanding down—and as young Solo, Alden Ehrenriech doesn't convince as a cocky young pilot and smuggler who's been prematurely soured by a hard-knock life. Or at least he doesn't convince as this particular smuggler. He's likable and does "confident" and "smug" very well, but if this film was determined to cast an actor who didn't look or sound all that much like Harrison Ford (which is a totally legitimate and defensible thing to do, don't get me wrong; a straight-up imitation would've been awful) it might've been a good idea to cast somebody who at least seemed as if he could eventually turn into the Han that we met in "A New Hope," as Lucas did when he hired Ewan McGregor to play young Obi-Wan Kenobi in the prequel trilogy. McGregor miraculously managed to maintain physical and vocal continuity with the role's original inhabitant, Alec Guinness, while still giving his own performance. Ehrenreich achieves that second thing here, but not so dazzlingly that you forget to obsess over the first. Some mysterious harmony ought to occur in a movie that constantly and very obviously tries to connect with its brand even as its lead actor does his own thing (mostly; the flirtatious grin is pleasingly Fordian), but the two impulses seem at odds with each other here. Was Howard expending so much effort bringing weight, maturity and sincerity to a movie that was at risk of turning goofy and glib under Lord and Miller that he didn't have the mental bandwidth left to focus on the actors? Some of the performers make a strong impression (particularly the alert and reactive Glover, who McGregors the part in a big way, and Phoebe Waller-bridge as the voice of Lando's copilot, L3-37, a robot fighting to abolish machine slavery). But others seem a bit lost at times. Clarke's character has many layers, but none of them quite seem connected to each other, and she comes across as much too nice to do some of the things she ends up doing. Newton, one of the stars of "Westworld," doesn't get much screen time, and Harrelson, one of those incorrigible kleptomaniac scene stealers, doesn't give us anything that we couldn't have gotten from any other fiftysomething character actor who can twirl a gun, crack wise, and smirk. Paul Bettany's crime boss Dryden Vos might be the first major player in a "Star Wars" movie to make no impression at all, but the actor was probably doing the best he could under the circumstances; he replaced Michael Kenneth Williams, who was not available for reshoots and was originally cast as a CGI character, so he was probably playing somebody who had to be rewritten on the fly without damaging the surrounding narrative architecture. (A documentary about this film's production troubles would almost certainly be more fascinating than the film itself.) Some of the unthinking racism that damaged “The Phantom Menace” returns here as well—you’ll know it when you see it—and the longer the film goes on, the clearer it becomes that “Solo,” like many a “Star Wars” film before it, is not too interested in women. I say all this with lifelong love for a film series, and in recognition of the challenges this project faced. "Solo" is in a unique and tricky position. Since taking over "Star Wars," Disney has tried to Marvel-ize Lucas' universe, extending the Skywalker-centric main storyline and filling it out with one-offs that flesh out stories that are adjacent to it. Whatever you thought of "Rogue One" as entertainment (I loved it), it managed to concoct a story with its own internal philosophy, style and feeling, and when you compare it with "Solo," you realize that a big part of what made it work was its lack of connection to famous characters who couldn't be killed off. Except for Grand Moff Tarkin, who was basically a bunch of Peter Cushing-shaped pixels, none of the major players were people we knew; most of them were characters we'd never heard of, the grunts and redshirts of the galactic war, and that meant anything could happen to them, and that the film didn't have to set aside a certain amount of space for enacting things we'd heard about but never seen dramatized. "Solo" doesn't have as much maneuvering room. It's not the first "Star Wars" film to visualize the pasts of characters that we'd spent time with in other incarnations—the prequel trilogy gave us a lot of information about Anakin Skywalker, aka the future Darth Vader, as well as Obi-Wan Kenobi, Yoda, Palpatine and others—but it is the first "Star Wars" movie that often feels as if it exists mainly to supply visuals for scenarios that fans have long daydreamed about, or read about in "Star Wars" supplementary texts. And even the greatest of filmmakers aren't likely to be able to give us images, performances and moments that exceed the ones we've been imagining forever. The bits that land tend to be ones that come out of nowhere and that have their own excitingly new emotional temperature, such as L3-37’s righteous ecstasy when she gets to free some fellow machines, and her frustration with Lando, whom she fancies even though he takes her for granted and is, shall we say, not compatible. "Solo" is hauntingly effective in a very specific way: it gives you a strong sense of Han Solo and Chewbacca's friendship: how it formed, how it solidified, and what it gave to each of them. Now that we've seen the full arc of Solo's life, the innocent joy of discovery that's present in every scene between the two of them acquires a sorrowful undertow. Chewbacca, we learn, was already 180 when he met Han. I'm not sure about Wookiee years-to-human years conversion, but the sheer amount of time that the big walking carpet has spent in the universe flips our perception of the friendship and makes us think differently about "The Force Awakens," where Han is an old man nearing the end of his run. If the entirety were as charming and unexpectedly haunting as the friendship between Han and Chewie, "Solo" might've been a classic. As is, it’s a frictionless trip down memory lane.